The BDA has a variety of volunteer opportunities that can match your interests and availability. Interested in volunteering for events or special projects? Contact Tom Barter, Membership & Events Coordinator, to discuss how you or your group can volunteer for the BDA: 207-729-4439, email admin@brunswickdowntown.org or fill out an online volunteer application here. Interested in being a Station Host for the Amtrak Downeaster? 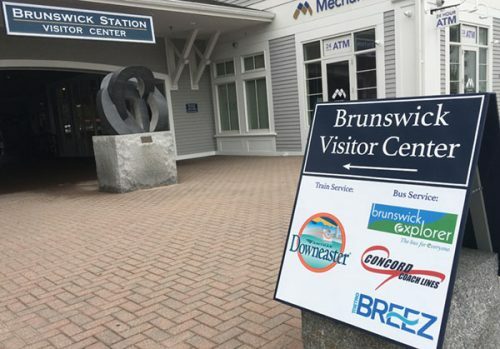 Trainriders/Northeast and the Brunswick Station Visitor Center are looking for volunteers to assist passengers and provide information to travelers. Flexible shifts are available. For more information, click here. Interested in being a Greeter at the Visitor Center? We’re looking for bright, personable people to share their knowledge and enthusiasm about Brunswick. If you would like to help welcome visitors, orient newcomers, and direct others to the wealth of resources in and around town, please consider becoming a Visitor Center greeter. Click to download Greeter Application Form. Mail this form to BDA, P.O. Box 15, Brunswick, ME 04011 or complete it online here.